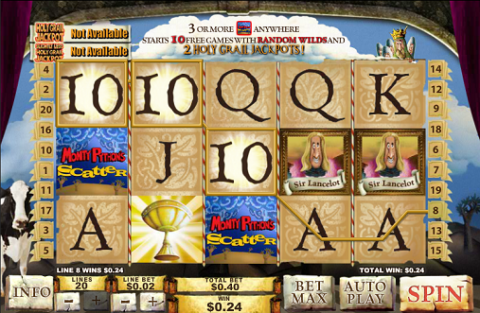 This slot is based on Monty Python’s ‘Quest for the Holy Grail’ film – and it manages to do a fantastic job of translating that quirky humor into slots play. There is a serious side to this slot too. It includes a progressive jackpot which is linked between PlayTech casinos. This is regularly in the $2 million+ range. 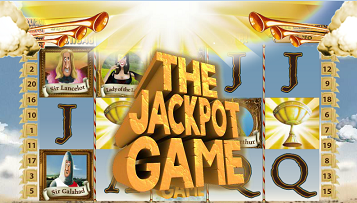 There are 4 general bonus features (all of them very funny), along with a free spins round which is the ‘major’ feature – which often leads to the final ‘Holy Grail’ bonus game where you can win the big prize. Here is what you will find in this Spamalot slot review: First of all the setup of the game and basics like smaller wins and bet sizes is covered. Next it is on to the bonus rounds, with the ‘Storm the Castle’, ‘Brave Knight’, ‘Knights who say ‘Ni’’ and ‘Killer Rabbit’ bonus games covered – before the big Holy Grail bonus is discussed. See the main PlayTech Slots Software page for links to many more reviews. When you strip away the knights, the cows and the general quirkiness of this game, you’ll find a 5 reel video slot game with 20 win lines. You can choose how many lines to play, and also your coin size. For max lines 20c is your smallest bet, and $50 per line ($1000) your biggest. The top symbol is the holy grail itself, which is also the wild. 5 of these will net you 5,000 coins – as well as substituting for the regular symbols. King Arthur is worth 600 for 5 of a kind, and the knights (Sir Lancelot, Sir Robin and Sir Galahad) 300. I find this game keeps the smaller wins coming in, so you’ll get a lot of play for your money. This also helps keep your bankroll topped up while you are waiting for the big money free spins round. The lady of the lake and card symbols make up the lower symbol. A bonus symbol comes in on reels 1 and 5, which triggers the 4 smaller bonus rounds. The scatter is a Monty Python symbol, if you get three of these you’ll trigger the free spins game. There are a lot of bonuses to get through on this game. The 4 everyday bonuses are given in sequence and come in quite a lot. The free spins bonus round followed (sometimes) by the Holy Grail game are less frequent – though they are a lot more profitable. When you hit a bonus symbol in the first reel, you’ll here ‘Spam, spam, spam, spam…’ as the final reel speeds up and spins. Storm the Castle: Here you pick circles for your knights to stand in while French people throw insults and cows at you. Each time the cow misses, you win more cash. Eventually your knights get hit by the cow and the game ends. The Incredibly Brave Knight: You take the first person perspective and fight the knight, chopping off his arms and legs to keep your bonus multiplier as high as possible. The Knights who say ‘Ni’: Here you choose from 3 shrubberies, either accepting the prize offered, or choosing again. The Killer Rabbit: You choose a rock and throw the holy hand grenade, if you do not kill the rabbit then he kills one of your knights. The idea is to get as many knights past as possible. These are very clever bonus games and will keep you amused (at least for the first 10 or so times you play each of them). If you did catch 5 logos, then you’ll move on to the jackpot bonus game (and be told to get on with it, since they have not got all day). This is a pick-em game, where you first choose a chicken, then a killer rabbit, then a hand, a knight, a cow and finally a monster. Each time you pick one, you either win cash or get an explosion, in which case your game is over. The monsters can win you a jackpot, with your chances of winning either the huge progressive or the smaller ‘no so holy grail jackpot’ dependent on how much your stake is. PlayTech have done a great job in making their slots available in your browser, as well as via a downloadable client for Windows or Mac. This will work for iPads, Android or Windows Tablets just fine, this is due to the use of HTML5, which responds to your screen size and whether or not you have a touch screen device. Some casinos may have a native app too - though this is not really needed any more than the old PC downloads are - the future of casino gaming is definitely in the browser window. I’m a big fan of this slot. My only reservation is that the frequent smaller bonus games can get a little dull. They do win you money, so things are not that bad! I love the free spins around, and the humor of the game goes into a lot of detail too – the giant foot for 5-of a kind, and the occasional cow popping its’ head up are just two examples. Best of all, while you are having fun, you could end up with a life-changing jackpot payout. Where to Find the Best PlayTech Slots?